This Baked Risotto Carbonara is the perfect solution for those nights you don’t feel like babysitting your risotto. Bake it instead! Yes, you read that right. Baked Risotto! Now before you think I’m just talking some sort of risotto blasphemy here, let me elaborate. I’m not suggesting that you should ditch the stir/ladle stove-top routine. There’s a reason people have been cooking risotto that way forever and the results speak for themselves. Let’s face it though, some nights, we want the risotto, but not the routine. That’s where this Baked Carbonara Risotto comes in. That and the fact that it’s incredibly delicious! I first discovered this recipe a few years ago. It comes from the British cook Delia Smith. I was, of course, quite skeptical the first time I made it. 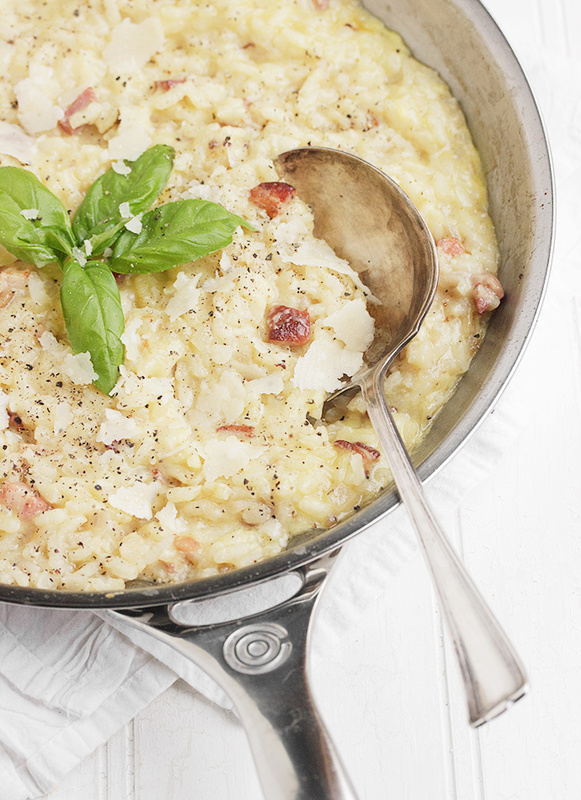 How could a risotto that doesn’t involve lots and lots of stirring compete? Well it did and it did so very well and here’s why. 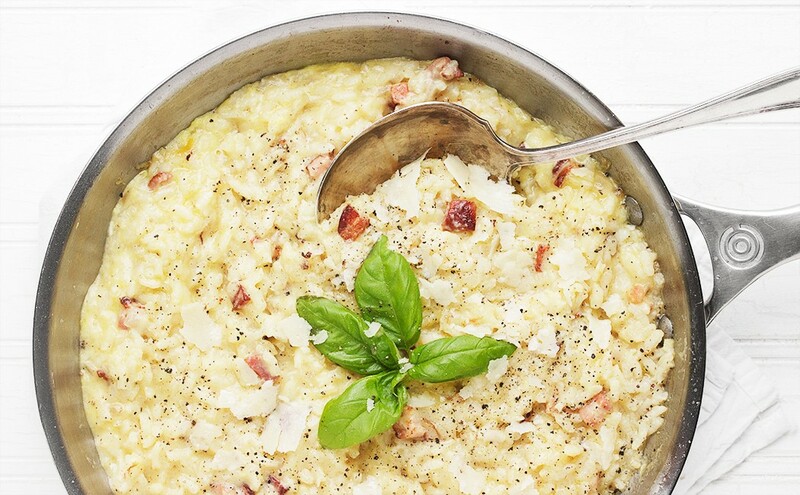 The fact that this risotto is intended to channel the classic flavours of pasta carbonara, means that eggs and a little creme fraiche are stirred in right at the end. I think it’s that addition that allows this risotto to be so successful. It essentially mimics the creaminess that you get from the stir/ladle technique, with a lot less attention. Beyond the simplicity of this recipe though, is the obvious appeal … carbonara! Pan crisped pancetta, with Pecorino and lots of freshly ground pepper and a creamy egg/creme fraiche addition at the end, is never going to be a bad idea :) I love this risotto on it’s own as a main with a salad or with a simple grilled chicken or fish. It’s flavours and creaminess are going to make it the star of any meal, so no point in trying to complete with it. A caveat with this recipe is that, like stove-top cooked risotto, this one is best eaten as soon as it’s cooked. Once you add the eggs and creme fraiche, allow it to stand for just a minute or so, then dig in. While I still really enjoy it after that (or as left-overs), the mixture does become thicker and stickier. Not un-delicious, but just less risotto-like. I’ve made some small adaptations to Delia’s recipe. I eliminated one of the two suggested egg yolks and about an ounce of the cheese. I don’t think it needs it and why not cut out a bit of it when you can do so without sacrificing flavour?! If you want to go all in though, feel free to add them. 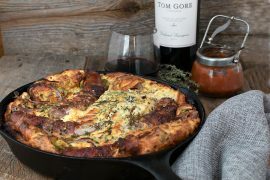 This recipe is easiest by using an oven-proof skillet - cast iron, or many stainless steel frying pans are oven-safe. If yours isn't, transfer to an oven-proof 9-inch round/2-inch deep baking dish. 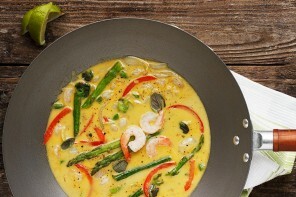 Note that this recipe contains eggs that are not cooked with the dish, but are added to the hot risotto at the end. So while they do cook somewhat, they are probably not cooked fully. 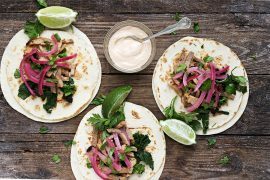 For this reason, this dish may best be avoided by pregnant women or anyone with a compromised immune system. Preheat oven to 300° F. (If your skillet isn't oven-proof and you will be transferring the risotto to a baking dish, place the baking dish in to the oven to warm while it's pre-heating). Heat a 10-12-inch oven-proof frying pan over medium heat. Fry the pancetta or bacon in its own fat for 4-5 minutes, until it's crisp and golden, then remove it to a plate. Add the butter to the pan, then the onion. Turn the heat down to medium-low and stirring occasionally, soften the in the butter for 3-4 minutes. Meanwhile, heat the stock in a small saucepan or microwave. Return the pancetta or bacon to the frying pan and stir in the rice. Move the rice around until all the grains get a good coating of the butter. Add the hot stock to the rice, along with some freshly milled black pepper. Increase the heat under the pan to medium and let it come up to a gentle simmer, then transfer pan to the pre-heated oven, without covering, and allow to bake for 20 minutes. (If using separate dish, remove from oven and add risotto to the dish. Stir once and then bake). When the risotto has baked 20 minutes, remove from oven and gently stir in the Pecorino until well combined, then set the timer for a further 15 minutes baking time. Meanwhile, whisk the egg, egg yolk and crème fraîche together. After the additional 15 minutes bake, remove the risotto from the oven and gently stir in the egg mixture, making sure it is well mixed. You may want to taste and add a bit of salt here, if necessary as well. Leave the risotto to stand for only about 1 to 1 1/2 minutes, by which time the eggs and crème fraîche will have thickened. Leaving the risotto to sit any longer will cause it to get quite thick and more sticky than creamy. Still good, but best eaten fresh from the oven. Serve on warmed plates with some more Pecorino Romano sprinkled over. This baked risotto looks glorious, Jennifer! Just the other day I had carbonara pizza and it was surprisingly delicious. I can’t wait to try this! Also, I tend to trust Delia, she is the real deal. :-) Beautiful photos as usual. Perfect dinner dish. This is on the menu this week. Thank You! 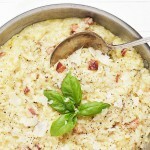 Your risotto looks delicious, had no idea it could be baked, making this for sure! Thanks Cheri. I certainly wouldn’t recommend baking most risottos, but it really works with this one! I love risotto but you’re right – sometimes all that stirring is no fun. Love this baked version! I adore risotto, but not so much the babysitting, can’t wait to give this method a shot, Pinned! Thanks Sue. I’m sure you would enjoy this one! This looks delicious Jennifer! I had no idea that you could bake risotto and I absolutely love carbonara pasta so this is a perfect match for me! Thanks Jessica. You would love this! What a great dish, Jennifer! 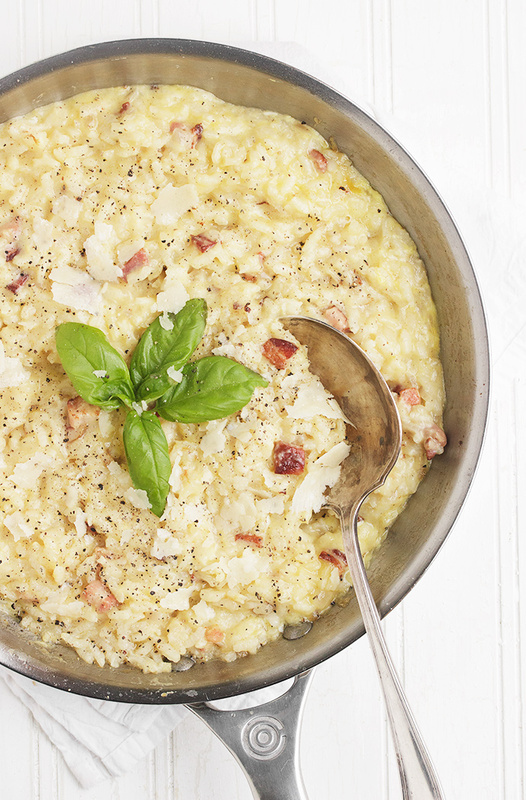 Risotto is a household favorite round these parts. And risotto without the work? I’m in!